The property has two bedrooms, one on the ground floor and the other in the loft which has been nicely converted. The property does still need some work like a new kitchen, bathroom and some other finishing touches around the house. The roof is in good condition and where the loft was converted has been treated and insulated. The property’s kitchen is still basic and would benefit from a new one. The floor is still exposed cement and the roof joists and tiles are visible. The room isn’t very wide but is long so it could be made into a nice open space kitchen diner. The only bathroom in the property is beside the kitchen but it would be easy to take the plumbing up to the loft meaning that you could make it into an en-suite. The living room is a good size and has new wood flooring. There is a traditional fireplace in the corner which has been kept as a nice feature and there has been a wood burning stove fitted. The ground floor bedroom is a good size and can be accessed from beside the stairs that lead up to the next floor. The stairs are new and have been made out of beautiful and great quality wood. The loft conversion has been well done and is nice and light. There is plenty of space to fit a bathroom as mentioned before and even some walk in wardrobes. Here the beautiful wood flooring continues as well as the lovely apex beams that have been left on show. Directly beside the house there is a stone annex which hasn’t been touched so is perfect to do with as you please. It could either be converted into more living accommodation or even a separate annex for friends and family to stay. The property has been newly re wired and has pre installation for air conditioning so a lot of the more expensive work has already been done meaning that it is mainly just cosmetic work remaining. Outside there is some outbuildings that are being used as storage but they could be converted into a summer kitchen and barbecue area. The property’s land measures 1680 sqm and has various trees such pomegranate, figs, orange, olive, walnut and pear as well as some grape vines. 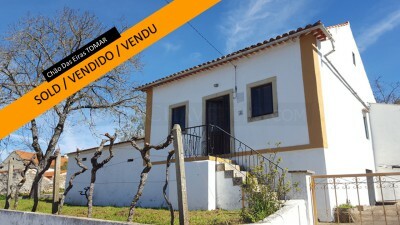 The property is situated in a small village belonging to the parish of Casais and Alviobeira, there is a café around 5 minutes away from the property. The popular and bustling town of Tomar, which is home to the UNESCO listed Convento do Cristo, is around 10 minutes’ drive from the cottage. Tomar has a range of supermarkets, shops, cafes, restaurants, bus and train station, cinema, bowling alley and library as well as pharmacies, banks, schools, hospital and weekly market.